Polish away imperfections for a flawless finish! The Optimum 5.25 Inch Microfiber Polishing Pad is engineered to eliminate fine swirls and restore maximum gloss to auto paint. The deep pile microfiber evenly distributes abrasives to create smooth, even results. 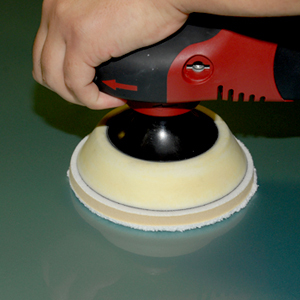 Use the Optimum Microfiber Polishing Pad with your dual action or rotary polisher. You'll like what you see! The size of the Optimum 5.25 Inch Microfiber Polishing Pad is perfect for polishing vehicles with more curves and fewer flat body panels. Many detailers also prefer this size for polishing harder clear coats. The Optimum Microfiber Polishing Pad offers maximum conformability to the shape of the vehicle. The thick microfiber spreads polishing abrasives evenly over the curves and contours of the vehicle. The variable surface of a microfiber pad - compared to a flat pad - enables more polishing action with every pass of the polisher. To get an idea of how this works, if you rub your hand over a flat foam pad, the surface doesn't change. If you rub your hand over a microfiber pad, the microfibers move. The same thing happens when the pad is working against the paint. The pad is working harder, but you're not. Optimum Microfiber Polishing Pads are made with a new, advanced laminating system that ensures the pads will not separate or delaminate. This added durability enables you to use these pads with a rotary polisher. The low profile, reticulated, open cell foam backing reduces heat and provides ample cushioning between the polisher and the paint. The foam gives the pad great flexibility. All Optimum Microfiber Polishing Pads are machine washable. Bring out a deep, reflective shine with Optimum 5.25 Inch Microfiber Polishing Pad.